What’s going on at the People’s Bank of China? No longer able to convince the world it’s got China’s economy under control, the government in Beijing is now trying to bully it instead. China’s economic weaknesses have been well documented. Among other things, there are the piles of bad debt, a rapidly aging population, sketchy “official” statistics, growing labor unrest, and a host of inefficient, bloated state-owned enterprises. All this has been known for years, and people have been predicting China’s “coming collapse” for more than a decade. But over the past few months, the government’s blundering attempts to control the stock market and the currency have finally shaken investors’ confidence in Beijing’s assurances that the economy is sound. At the World Economic Forum in Davos last month, hedge fund manager George Soros warned that China faces a “hard landing,” while IMF head Christine Lagarde said China’s “communication issues” are upsetting markets. With its good-news machine hitting a wall, the government is resorting to increasingly desperate and aggressive measures to fix things—and instead making them worse. China’s government notoriously runs the most effective propaganda operation in the world. It controls information inside China so effectively that most local university students don’t know the Tiananmen uprising happened, and think the country’s territorial claims in the South China Sea derive from ancient history, not from 1947. But that tightly controlled message fell apart this past summer, and has never recovered since. 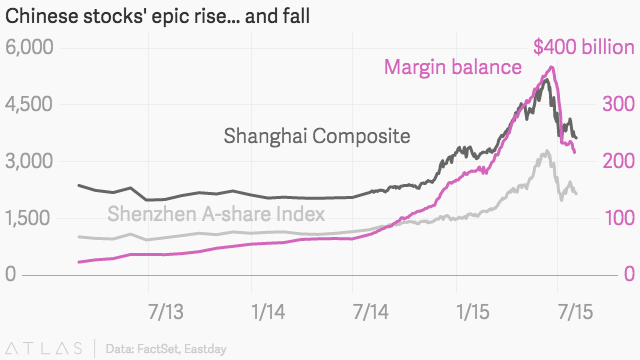 First, China’s stock markets dropped sharply in June. Beijing stepped in with over $1 trillion of stimulus to prop them up—an attempt to control the very markets that Xi had promised to liberalize. Even though there’s little foreign money invested in China’s stock markets, their apparent fragility, and Beijing’s reaction, sent world markets tumbling. Then in August, when Beijing unexpectedly devalued the yuan by more than it had in 20 years, global markets—used to the deliberate guidance of the US Federal Reserve and the European Central Bank—plunged again. Finally, at the start of this year, China’s markets wobbled and the central bank stepped in once more to weaken the yuan without warning. Foreign investors have been left to decipher what’s going on in China by parsing reports from a censored press, opaque information from state-owned enterprises, and what little information comes from officials who don’t really speak to analysts, journalists, or the general public. This isn’t exactly filling them with confidence. Days earlier, Fang’s boss, Xiao Gang, had told his colleagues that China’s stock market problems stemmed from ”an immature market, inexperienced investors, an imperfect trading system, and inappropriate supervision mechanisms.” Soon after, according to a Reuters report, he offered to resign. The report was then refuted by Chinese officials, who promptly shut down Reuters’ social media account in China—giving it even more credibility. If you bully them, will they invest? In the face of rising criticism and doubts, Chinese officials and media outlets have dropped their assertive, confident overseas propaganda for a brittle, shrill, and sometimes clueless approach. Rather than reassuring investors around the world that regulators are listening to critics, Beijing seems to be trying to browbeat them instead. “Reckless speculations and vicious shorting will face higher trading costs and possibly severe legal consequences,” Xinhua warned on Jan. 25. Critics of China’s economic policies ”either haven’t done their homework” or are deliberately trying to stir up panic, state newswire Xinhua wrote last week. On Feb. 3, Xinhua called naysayers “jealous” and said the biggest problem China faces is negative sentiment. China’s premier, Li Keqiang, meanwhile, sounds so out of touch that it beggars belief. “In recent days, there have been many international voices ‘shorting’ the Chinese economy. Some have even claimed that China’s slowdown is affecting the global economy—how absurd,” Li said on Jan. 27, according to remarks quoted in the South China Morning Post (paywall). What’s absurd is for the top economic official in the world’s second-largest economy, its top exporter, and the biggest consumer of many key commodities to disavow any link with the global economy. Spooked investors aren’t hanging around to see whether officials can get their story straight. An estimated $676 billion in capital fled China last year, most of it at the end of the year. This accounted for the bulk of of the $735 billion in capital that was yanked out of emerging markets in 2015. Trying to scare China bears off with heavy-handed statements is “obviously not” working, Li-Gang Liu, ANZ’s Greater China chief economist, told Quartz. At the moment, foreign institutional fund managers have almost “zero” of their funds allocated to China, which is ridiculous considering it is the world’s second-largest economy, Liu said. It’s also having a similar effect on domestic investors. “The more that they make such statements, the more ordinary people in China interpret it the other way,” Liu said. The constant and overbearing attempts to browbeat investors into believing in China’s economic strengths “is not useful and could be counterproductive,” he said. Indeed, investors think the yuan will weaken further. Futures contracts allow them to bet at what rate the Hong Kong-traded “offshore yuan” (which was introduced by Beijing as a way to internationalize its currency) will be trading against the US dollar months or years from now. The contract for March next year suggests investors think it will be at 7.02 yuan to the US dollar as of Feb. 3, around 5% lower than it is today. And they’re piling into that bet. Open interest, or the number of contracts written on that dollar/yuan bet, have increased from a few dozen in mid-November to more than 5,700 at the end of last month. 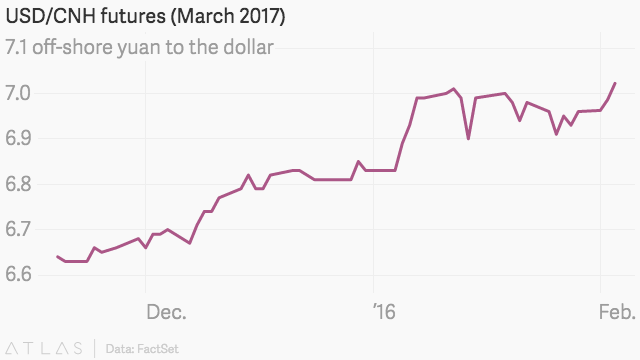 China’s central bank has spent $321 billion to prop up the currency since August, with little effect. Ultimately, Beijing “can make it difficult to short the yuan, but it cannot stop it completely,” Francis Cheung, China-Hong Kong Strategist at CLSA told Quartz. Compounding its clumsy economic communications, Beijing is stepping up an increasingly brutal, unabashedly public global campaign against critics of the Communist party. Investors have generally looked past China’s periodic crackdowns on free speech and other human rights under Xi, but its most recent efforts, which may violate international law, are harder to ignore. Beijing is believed to have abducted several Hong Kong booksellers, and forced the public “confessions” of two Swedish citizens on Chinese television and the ejection of one from China. The government is also believed to be behind two Chinese citizens being “disappeared” from Thailand. Meanwhile, as Taiwan went to the polls last month, China’s state media celebrated a Taiwanese teen’s tearful televised apology for waving Taiwan’s flag—possibly tipping an already anti-Beijing election even more against the mainland. Underpinning the crackdown on booksellers is a deeply divided Communist Party, academics and publishers in Hong Kong believe—yet another issue for investors to fear. The way out of this mess has also been well documented, and promised before by Beijing. The Xi government needs to follow through with reforms to giant state-owned enterprises; allow local officials more leeway to manage their own operations; and ultimately attract foreign investment to these inefficient firms. It also needs to reform the country’s capital markets to allow and attract investors—from sovereign wealth funds to central banks—and restore confidence that its stock markets are not a government-rigged charade by letting them operate freely. But for this, Beijing’s government would have to more or less reverse the course it has followed since Xi took the helm in 2012. To consolidate political power, he embarked on an anti-corruption drive that has also wiped out his alleged political rivals, their supporters, and their supporters’ supporters. “The government has been very good at having grand plans and short on having concrete actions,” ANZ’s Liu said. The anti-corruption campaign has left bureaucrats and officials so paralyzed with fear that they could be unfairly targeted if they make a mistake that they’re not doing anything at all, he added. It is nearly impossible for foreign companies to move in new projects in China right now, an adviser to multinational companies in China told Quartz. “Everyone [in the government] is new, everyone is scared, and nothing is getting done in Beijing,” the adviser said. “If we see another year of inaction and highly inefficient policy-making, people will continue to become more pessimistic,” Liu said, and “calls for China’s hard landing will become stronger and stronger.” This time, the forecasters may be right.